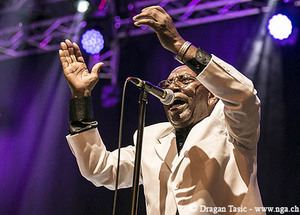 Attracting people from far and wide, the annual Destination Blues Music Festival takes place in Danville, Bloomsburg, and Berwick, Pennsylvania, featuring acts ranging from solo acoustic performers to electric bands to a full Gospel choir. Most of the performances take place in family-friendly restaurants and bars with no cover charges; attendees enjoy the best of our area’s food and drink – think brewpubs! – in addition to the music. Venues hosting the two main events include a Masonic temple and a church sanctuary, both landmarks of Victorian-era architecture that create unforgettable experiences. The 5th annual Festival will have 35 performances in 18 venues by more than 70 musicians – the biggest musical weekend of the year in Columbia and Montour Counties. Supported by the Columbia County Commissioners and Montour County Commissioners, the Festival draws visitors from at least eight states and the District of Columbia, helping to fill hotels and restaurants at a time of year when people need a reason to leave their cozy firesides and go out to do something fun. The Exchange, a 501(c)(3) non-profit organization, produces Destination Blues as part of its mission to bring the arts to all communities throughout our region. In addition to Destination Blues, The Exchange also produces Bloomsburg’s ArtFest, with fine art, music, and food, at the end of August; coordinates Halloween window-painting in October; and collaborates on BOO!burg and other community events through-out the year. The Exchange Gallery, at 24 East Main Street in Bloomsburg, hosts art exhibitions year ’round with work by artists of all ages and levels of experience from throughout central Pennsylvania and beyond: The “Cash & Carry” show at the end of 2017 drew more than 521 pieces by more than 250 artists, from Bloomsburg University art professors to three-year-olds; they came from more than 30 municipalities in more than a dozen Pennsylvania counties, from Wilkes-Barre to Williamsport to Hershey. As part of its outreach mission, The Exchange brings the “Backstage Pass to the Blues” program to schools: Our world-class Blues musicians teach the history of the art form to the next generation of Blues fans. 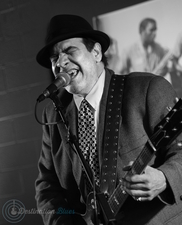 The Blues musicians, many of whom perform at Destination Blues, share their talents, knowledge, and experience to promote love for and respect of music among students at our public and independent schools. Programs are tailored to each school’s needs, whether assemblies mixing lessons with a band playing, or individual performers conducting classes in Blues history, musicianship, and the music business. Programs are supported through grant funding, sponsorships, donations, and income from the Festival, so its provided at no cost to the participating schools. On the last Wednesday of every month, The Exchange hosts a Listening Room in its Gallery: Blues musicians up close and personal in our intimate space – just the audience and the music. Past performers include Mike Miz, Bobby Kyle, Gabe Stillman, Clarence Spady, and Anthony Hannigan; coming up in 2018, Sean Farley, Ed Randazzo & Bret Alexander, and Dustin Douglas. In further outreach, the Exchange’s Art Cart helps bring out the beauty in each person, at venues ranging from childcare centers to nursing homes, reaching more 2000 people every year. The facilitators bring simple materials, many of them recycled, for activities such as making suncatchers from empty water bottles or used CDs. The Exchange relies on a large number of dedicated volunteers to make everything we do possible, starting with our board of directors who set policy and make strategic decisions. Other volunteers work throughout the year on all of our programs, including the Gallery and all of our events, from ArtFest and BOO!burg to “Backstage Pass”, the Listening Room, and Destination Blues. Headlining the 2018 Festival: Victor Wainwright & The Train! 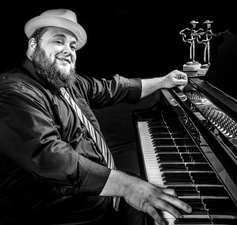 At 9 p.m. on Saturday, the 17th of February, 2018, the high-octane boogie piano and soulful vocals of Victor Wainwright and one of the most gifted bands on the scene will come to the Auditorium Stage of the landmark Caldwell Consistory in downtown Bloomsburg, Pa., to headline the 5th annual Destination Blues Music Festival. 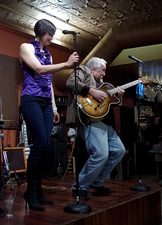 Right before Victor, at 7 p.m., returning to Destination Blues, Vanessa Collier! With the success of her debut album and her charismatic live performances, Vanessa has been in demand touring throughout the world. 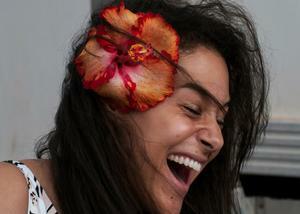 Vanessa also maintains a private saxophone studio teaching about 30 students per week. She volunteers her time in schools in Pennsylvania, Delaware, and Maryland; serves as an adjudicating judge at solo & ensemble festivals; and offers Jazz, Blues, and saxophone clinics throughout the United States. 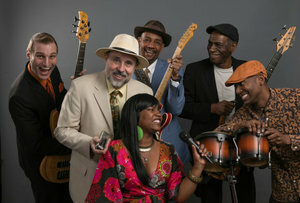 And at 5 p.m., for the first time at Destination Blues, Mississippi Heat! Unapologetic, opinionated, big-hearted, and most importantly, authentic. Born in Baltimore and raised in Texas, Ursula takes you on a journey through a life of Funk/Soul/Neo-Blues. Bobby Kyle leads his high-energy quartet at clubs and festivals around the Northeast; previously, he spent eight years touring the world with the late guitarist, songwriter, and singer Johnny ‘Clyde’ Copeland. Blunt and to the point, Bobby’s singular styling resonates with maturity, talent, and inspiration – contemporary music that you cannot mistake for anyone else’s. Capturing the vibe of late 60’s and 70's Blues-laced Rock ’n’ Roll, Dustin Douglas & The Electric Gentlemen mix retro-style and groove for a lightning-charged, vintage style all their own. 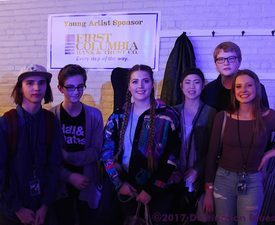 These young musicians, from Williamsport’s Uptown Music Collective, have wowed crowds in our region for a couple of years already, including at our “Backstage Pass to the Blues” programs – and none of them has graduated from high school yet! Here is the rest of the lineup for this year's Destination Blues Festival. – The Mighty Susquehannas at Berwick Brewing, 6-9 p.m.
– Mike McGonagle at Berwick Brewing, Berwick, 9-11 p.m.
– Bill Talanca at Bandit's Roadhouse, Berwick, 8-11 p.m.
– "The Blues Show" reception at The Exchange, Bloomsburg, 5-9 p.m.
– Kimbo & Bryan at The Exchange, Bloomsburg, 5-8 p.m.
– Mike Stec at Turkey Hill Brewing, Bloomsburg, 4:30-6:30 p.m.
– Nate Myers & The Aces at West End Ale Haus, Bloomsburg, 10 p.m.-1 a.m.
– Dave Brown & Dave Hampton at Marley's Brewery, Bloomsburg, 8-10 p.m.
– Totem Pole at Fog & Flame, Bloomsburg, 6-8 p.m.
– Sean Farley at Rose Marie's, Bloomsburg, 9-11 p.m.
– Brothers Gilliland at Filet 18, Bloomsburg, 9-11 p.m.
– JP Williams at the Pine Barn Inn, Danville, 7:30-9:30 p.m.
– Allan Combs II at Old Forge Brewing, Danville, 6-8 p.m.
– Sweeney Blues Revue at Old Forge Brewing, Danville, 9-11 p.m.
– Teddy Young & The Aces at Rock God Brewing, Danville, 7-10 p.m.
– Backyard Ponies at LT Evans, Danville, 9-11 p.m.
– Blues Brunch at Balzano's Italian Kitchen, 112 East Main Street, Bloomsburg, 10 a.m. to 12:30 p.m.: Bobby Kyle & The Administers, $12.95 per person. guests BEAREATHER REDDY and J.T. BOWEN and a local choir! EVERYONE GETS IN FREE, but bring a donation of a food item for the Community Friendship Meal: canned goods, dried pasta and rice, peanut butter, or cereal.